The CD of dutch jazzsinger Chris Peeters is a fact! Come join the official presentation on September 13th in Rotterdam. Last weekend was great fun in Amersfoort. On Saturday I played with Zule Max. We were the finishing act at the “Hof” stage. The square (which is pretty big!) was getting so crowded, the organization had to shut the entrances! 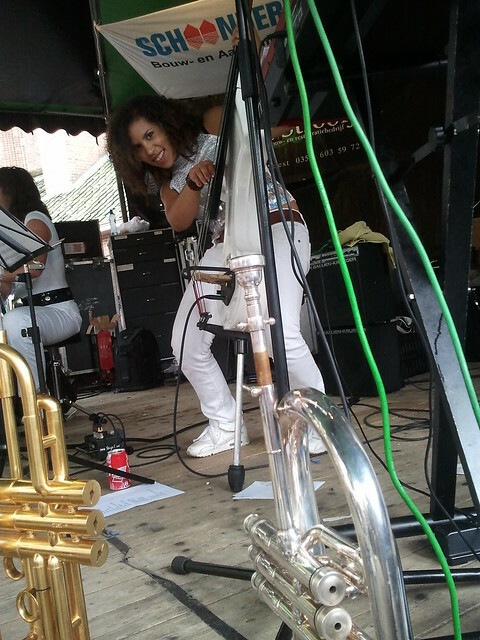 Next day I played with Leticia y su Rumbadama at the wonderful cosy Groenmarkt location. Great to play with a smaller band and to have some more solo space! Performing with that band is always such a great joy! Since I had a carpool date with bassist Adinda I had to attend the Cubop City Bigband gig as well. Can’t say I minded: it was a good concert with a good atmosphere, and I got to meet up with some old friends. Next gig with Leticia y su Rumbadama is September 3rd at “Het Witte Theater”, IJmuiden. I would say: not to be missed!